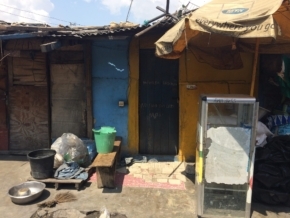 When it comes to sustainable improvements in community water and sanitation access, the “hardware” (physical facility) is just the beginning — it’s the “software” (changing attitudes, behaviors, mindsets) that makes the difference. Equally important is addressing the economic dynamics that govern people’s water vending and purchasing behavior. In the peri-urban community of Manhean, in Ghana’s Greater Accra Region, there’s a WaterHealth Center, a surface water kiosk that uses UV and other technologies to treat raw water sourced from the nearby Densu River. The center treats the raw water, making it clean and potable for drinking and household uses. In terms of operations, the water kiosk is pretty top notch: the facility managers keep the center running during regular hours of operation, they track sales on a daily basis and the residents patronizing the facility are happy with the water quality. Community residents can fetch water from the kiosk at a cost of 25 pesewas (about 10 cents) per 20 liters, and the water from the kiosk is available in both rainy and dry seasons. The community received the main water kiosk (and two vantage points) more than a year ago, but not everyone in the community is patronizing the water. Many of the residents are used to fetching from the river for years, and so the idea of paying for water, no matter how clean, isn’t something they are willing to do yet. In addition, there appear to be deeper economics at play, revealing that the challenge to improve water access goes much further than a physical facility and identifying residents’ ability to pay. There’s the importance of convenience (in terms of time in fetching water), individual and household willingness to pay (as well as opportunity cost = all the other things they would have spent that money on). There’s also the importance of having all available market information (about prices) and health information (understanding of why it’s more healthful to drink and use the potable water, rather than the raw river water). Also, people’s attitudes may or may not have changed, despite the introduction of this new water facility, and despite the behavior change communications and hygiene education that was done. There’s also the role of intermediate players in the water sector, like intermediate private vendors who make a business out of fetching water, transporting and selling it (or reselling it) to customers for profit: At what price are they selling the water they deliver? For people who are still too far away from the main water kiosk or vantage points, what are their options, really? Is providing a main water kiosk and two vantage points in a peri-urban context sufficient? So how does this play out? It’s an inefficient market solution, because it doesn’t take into account all of the players in the system — those living nearby the water points, those living far off from the water points, and the existing private vendors (and perhaps new ones too that emerge with this new water opportunity and demand for improved water). So, there are plenty of people fetching water from the water kiosk, and there are also plenty of people still using the river water. 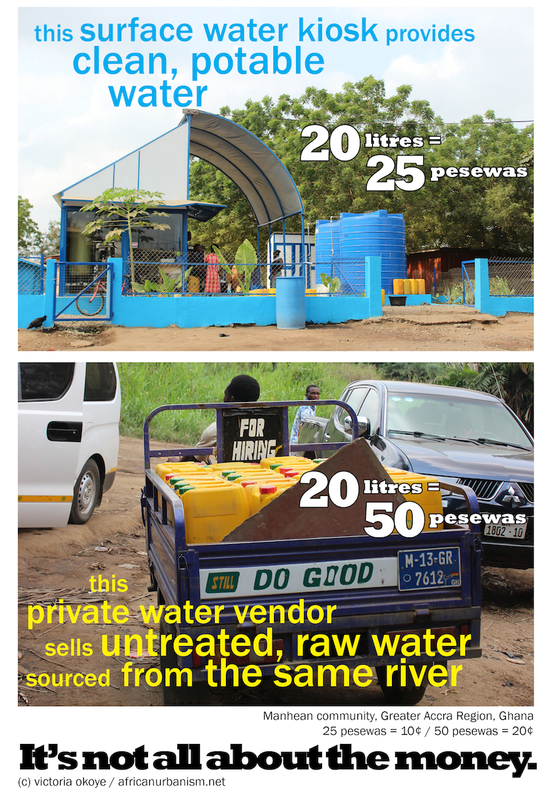 There are also private water vendors who fetch water from the river and resell it to their customers — at twice the rate at which clean water is sold at the water kiosk. As the landscape of water access improves with the introduction of this facility, the existing market players also move and shift to keep themselves relevant. This challenges the assumption that people in peri-urban areas, like in rural areas, will travel long distances for improved water and that price should be based solely on household’s ability to pay. In this case, there are those who won’t travel the distance, but rather pay someone else to do so – and end up paying more than the improved water option provided to the community. So, improving water access in this community requires a hardware intervention, a software intervention, and an appropriate overall market intervention. That said, can we incentivize these private vendors to sell the clean water, and at an affordable price that balances their profits and people’s wallets? What would a solution that takes into account these players look like? Previous Story Previous post: What about Africa’s rural communities?